If I've told you once, I've told you again...I cannot be trusted with cookies. I find this really strange because I truly prefer savory snacks over sweets. Put a cookie in front of me however, and I can't be held responsible for the outcome. Growing up my favorite was oatmeal raisin. For a while there peanut butter took the top spot. I even had a dangerous stint with double chocolate. 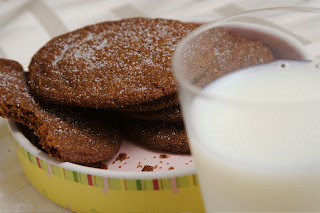 Trust me, just writing the names of my past favorites has me drooling but thankfully I have a new favorite to tide me over...chewy gingersnap cookies. I've always loved gingersnaps, I suppose they have just taken second place to my other faves along the way. Well, not anymore. These are the current stars of my cookie life. This recipe is exactly what I want in a gingersnap; chewy in the middle with a little crunch around the edges. Clearly I am a total cookie floozy and I'm sure I'll fall head over heels for a another flavor in the near future, but for now these gingersnaps own my heart. Preheat oven to 350 degrees F (175 degrees C). Sift the flour, ginger, cinnamon baking soda, and salt into a mixing bowl. Stir the mixture to blend evenly, and sift a second time into another bowl. Place the butter into a mixing bowl and beat until creamy. Gradually beat in the white sugar. Beat in the egg, and dark molasses. Sift 1/3 of the flour mixture into the shortening mixture; stir to thoroughly blend. Sift in the remaining flour mixture, and mix together until a soft dough forms. Pinch off small amounts of dough and roll into 1 inch diameter balls between your hands. Roll each ball in sugar, place 2 inches apart on an ungreased baking sheet and flatten slightly with the palm of your hand or the bottom of a glass. Bake in preheated oven until the tops are rounded and slightly cracked, about 10-12 minutes. Cool cookies on a wire rack. Store in an air tight container. I truly adore a good gingersnap. And "chewy" is on my list of favorable qualities. Thanks for the recipe. Sounds terrific! Hi Lo, I find that they get crisp with age which are still really good but if it's chewy you want, I would enjoy them right away. Thanks John and Hallie Fae! This is a Flickr badge showing public photos and videos from Madelines Adaptations. Make your own badge here.